The standard 4x4 mechanical version is still a favorite at our house. I always lose to my wife and daughter. There's an iPad app called Word Genius which is a very good imitation of Boggle. You can select the grid size from 3x3 to 8x8, set minimum word length (I prefer not to bother with 3- and 4-letter words), and play against the clock or just try to find all the words in the grid without a time limit. 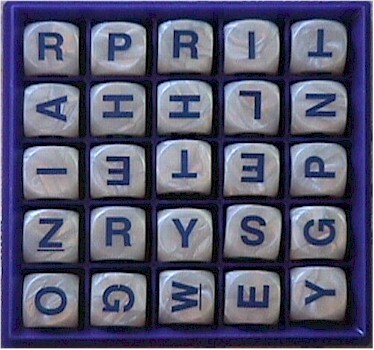 The game shows a running tally of the percentage of the possible words that you have actually found. And let me tell you... if you achieve 50%, you're doing very well; if I have any complaint about the game, it'd be that its dictionary includes lots of weird words. A son of a friend of mine actually had a hand in inventing this game, but I had never heard of it until she mentioned it to me about four years ago.